The Scottish Football Association has apologised and offered refunds to disabled fans who had their view of the Scotland-Germany match at Hampden obscured by advertising boards. 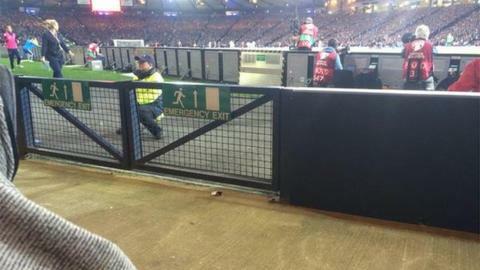 Photos on social media showed areas reserved for fans in wheelchairs gave a limited view of the match because of the advertising surrounding the pitch. Responding to BBC reporter Mark Daly on Twitter, SFA chief executive Stewart Regan said it was "unacceptable". The SFA said it will review its policy. In a statement, it said: "The Scottish FA apologises unreservedly to those supporters accommodated in the South Stand accessible areas whose view was seriously restricted by the double television production. "We will offer a full refund to those supporters affected and will review matters ahead of the European qualifier against Poland next month." Keith Ferguson of the Scottish Disabled Supporters Association told BBC Radio Scotland those affected were very disappointed. "Some went home before the game even started as they realised they wouldn't be able to see the game and there wasn't any alternatives," he explained. "A few people found some other areas at which to view the game. A few wheelchair users managed to transfer and struggle on to seats to watch the game but for everybody that was involved this was a very disappointing situation." SFA chief executive Stewart Regan was made aware of the problem midway through the first half. "I was notified and it was extremely disappointing and unacceptable as far as the SFA is concerned," he told Newsdrive. "We've got a very good relationship with the Scotland Disabled Supporters' Association. I've carried out a full investigation today and the situation was caused by the instillation of double production boards to allow the match to be advertised back in Germany. "It's the first time we've had such a system in place. Unfortunately, the sight lines weren't checked as thoroughly as they should've been. "There was a vital part of the pre-match check that didn't happen. That situation will be resolved in time for the Poland match [on 8 October]. We will be having double production again and there will be advertising boards again." Mr Ferguson confirmed he has been speaking to the SFA and is confident there will not be a repeat of Monday's issues. "They were quite horrified that it had ended up this way and were full of apologies," he added. "They felt very sorry for the fans involved and acknowledge that something went badly wrong. "The association said it will continue to work with clubs around the country to make sure wheelchair users can enjoy games in elevated positions, under cover and with views unobstructed by staff or advertising. "It takes time to get stadiums upgraded. Some are old but over the last couple of years we have seen a lot of improvements in Scotland working with the clubs and hopefully that will continue." How can Scotland reach Euro 2016?